Lit Lesson #13: George Saunders, Transcendent or just Experimental? The Summer Studio has been very busy reading, thinking and talking about the collected work of George Saunders. I believe he potentially represents a new order of writer, someone who could possibly take literature beyond the five hundred year log jam of ego based writing (see Christopher Booker’s Seven Basic Plots, Chapter 21). We will be studying Booker and this log jam in the fall, but for the summer I wanted to see if Saunders is actually one of the transcendent writers of our time. Translation, is his writing just an unconscious regurgitation of his own egoic limitations? Or is he breaking new ground? That answer to those questions in a moment. Hold steady. Artistically, Saunders has garnered attention and position. He is a darling of the NY literary scene, has speed dial access to Debra Treisman (fiction editor at The New Yorker), and has an impressive almost otherworldly resume. From this position of accomplishment and greatness, Lincoln in the Bardo. You may have heard about this book, may have attempted to read it even, may have had to put it down in confusion, or may have gobbled it up with glee. But have you spoken about this book honestly? That’s hard to do when you are faced with a writer of Saunders reputation and are surrounded by adoring acolytes. As writers and thinkers, it is our job to push beyond crowd following for the sake of crowd following. It’s our job to say, “I don’t get it,” or “I do get it, but it still bugged me,” or “I get it, I liked a bit about it but other parts, not so much.” From this conversation, we grow. In our Studio, one writer said she respected Saunders, very much, but didn’t feel connected with the characters. “I wasn’t engaged.” Another writer (a couple actually), were baffled but then became totally engaged by the mythical aspects of certain characters. Another group of writers struggled because the key characters were ghosts, making their story mostly flashback, and so experience was hard to see. Personally, I did not find myself able to invest in the ghosts and the jumping between voices was hard to follow (and too much work, too much like following Twitter or texting). To my challenges on this book, Saunders said that being dead would be disturbing, so he liked that artistic choice. He has also said (and I’ve heard this from other writers as well), that literature is supposed to make you work. Okay. I get it. Other writers in the Studio found this book a great victory because it was so totally unusual, like the music of Bob Dylan, or Nirvana (both questioned, at the time, as strange and incomprehensible). The same goes for the movie making technique seen in the film American Beauty. Lincoln in the Bardo pushes an artistic edge all the way beyond traditional story telling. That’s inspiring. Lincoln in the Bardo is experimental and highly specialized. Saunders asks the reader to think and absorb story in a new way. It’s not necessarily for the traditional reader, or writer, or thinker. 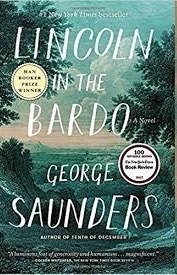 There’s no question that George Saunders is a very fine writer, at the sentence level he is indisputably a craftsman, and in this book, he challenges the reader to embrace disembodied characters that cannot be imagined very easily, and to take in historical data that has been, in part, manufactured. It takes a considerable effort, much like many of George Saunders short stories, to figure out what’s going on and follow the action, but it is exactly that effort that produces great results. Saunders is introducing deep themes which include what happens when we die and the stories we tell ourselves that trap us in realities that actually don’t exist. Click here to listen to an except from the class on these themes. So that takes me back to the question at the top of this blog. Is Saunders part of a new movement of transcendent artist? Yes? No? I say: Perhaps, and even lean toward “Yes.” Trust me, I think Saunders has as much ego as the next guy. Based on his lectures and his writing, I believe he struggles like anyone else, and that he has a solid identity as husband, father, writer, teacher, artist, human, but I think he might be one of these new writers because of the way he points the spotlight on the movement of the mind. Saunders is not just running the mind and the story down a narrow line to deliver a plot, he allows a wide meandering of the mind (something that can be annoying and confusing at times), and documents that fluidity in a way that makes the reader acutely aware, uncomfortably so, of their own minds (and this is when the annoyance stops because the reader gets that “ah ha,” moment where they realize…”I’m that way too!”). Also, Saunders, a practitioner of Tibetan Buddhism, has awareness of mind and brings that knowledge to his art. So, again, yes, I think he is a writer who might be part of a new movement in literature. I think he is someone to watch. The more he grows in awareness and compassion, the more his writing will grow too (I hope). A couple links you might enjoy: Saunders on First Draft. Saunders on Literary Arts. PS: Get on the mailing list to get free teachings. Click here.